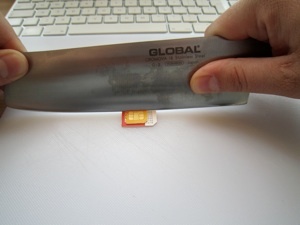 Home » Simple » Simple fix: Convert a SIM to a MicroSIM… with a Meat Cleaver! Well this guy knew more about how sim cards work and made this awesome Sim to MicroSim card hack or slice rather. Apparently you can just cut it to fit and it works. Who knew? Read how he did and see the cut by cut details. Its awesome.